"Only the mad know, the impossible is possible!" This Blog is offering a colorful kaleidoscope of movie magic for cinema aficionados. The Swashbuckler flicks of Director André Hunebelle ('Fantomas') have almost all a special flair and style. 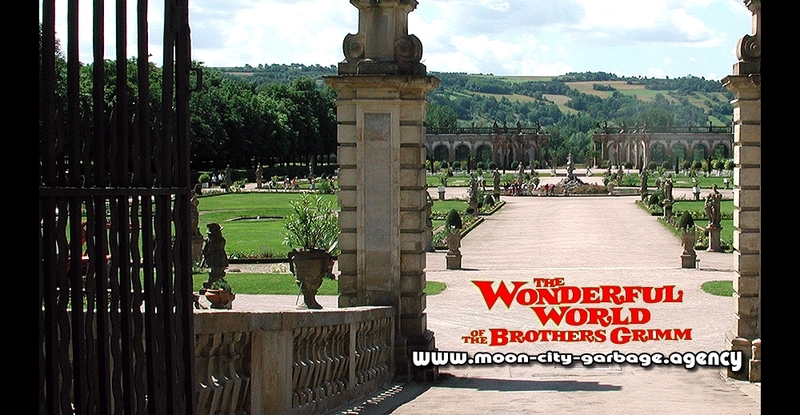 Opulently produced movies with great costumes, glorious locations and refreshingly easy stories. 'Le Miracle des Loups' is no exception and fits into a series of fine films. André Hunebelle has his favorite stars by his side. Actor Jean Marais, cinematographer Marcel Grignon and costume designer Mireille Leydet. His three experienced Musketeers for the Swashbuckler genre. Besides actor Jean Marais we get to see Roger Hanin and the beautiful Italian Star Rosanna Schiaffino in good roles. Rosanna has a few nice moments and this odd, mysterious action scene in the snow with the pack of wolves. spectacle that aesthetically surpasses almost all cheap-looking Italian Swashbuckler films. Lots of well done and stylish outdoor scenes. The medieval fortress, known as the Cité de Carcassonne, is a fabulous filming location. and lots of stunt work. The French veteran was an expert for battle scenes and the resulting stunts, no matter in which genre. like the great 'Peur sur la ville' with Jean-Paul Belmondo. The Knight tournament set looks bigger than it actually was. They only have a few tents and a small elevated and covered grandstand for the rulers and dignitaries. The Set decoration & Costume design is pretty cool and with attention to details. Cinematographer Marcel Grignon ('Un taxi pour Tobrouk') filmed some nice pictures here. Behind the scenes of 'Le Miracle des Loups', 1961. 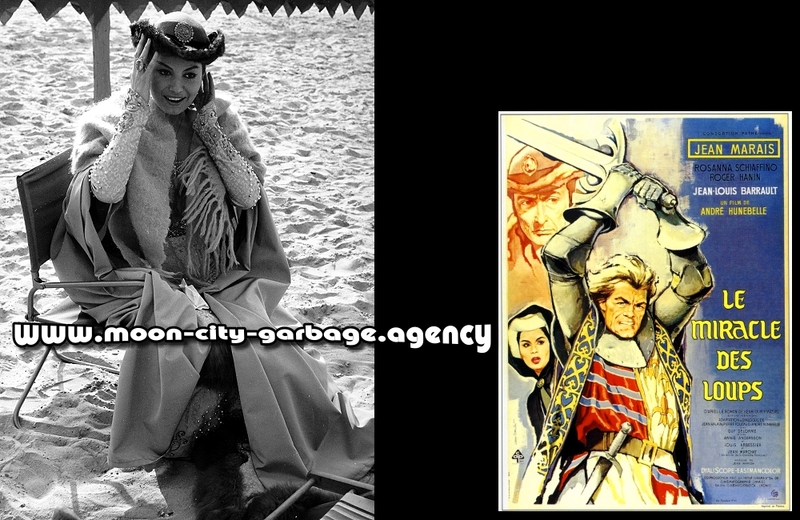 Rosanna Schiaffino on the not quite finished set for the knight tournament in her lavish costume. You can see a few guys of the set construction crew in the background working on the set. Screenshot of the Knight tournament set. A big sandbox for the knights as a playground! The movie has the heart on the right place and offers soothing old-fashioned entertainment. Nothing really thrilling, but perfect for a rainy Sunday afternoon. Jean Marais (1913–1998) has a small scene reminiscent of his later hit 'Fantomas'. A short Mexican Wrestler meets Fantomas show. A must see! And Rosanna, well, she looks beautiful and graceful, that must be enough. See more of Rosanna Schiaffino (1939–2009) here: The Victors. 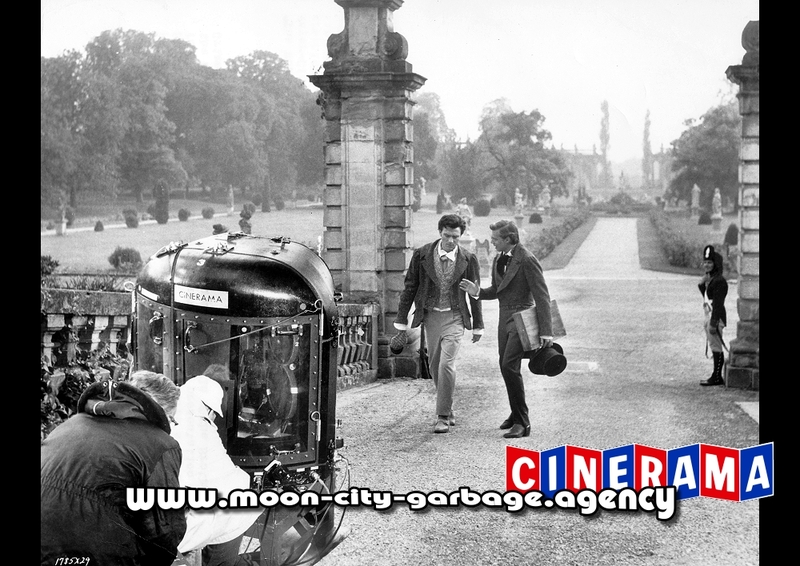 Christine Kaufmann, the young wife of Tony Curtis, visited her husband during the filming of 'The Great Race'. The movie was wrongly advertised as Super Panavision 70 on the back of this press shot and other promotion material. 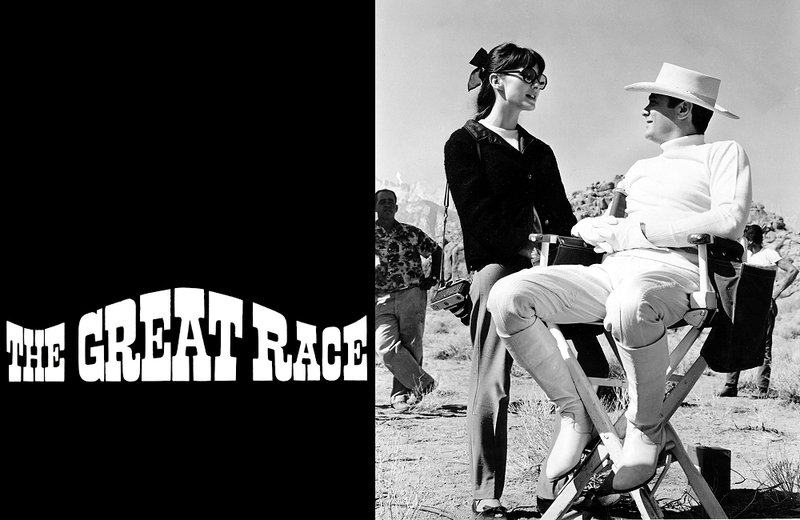 'The Great Race' was a Panavision 35mm (anamorphic) epic which was shown in selected cinemas as 70mm blow-up version. A 70mm release print from the 35mm negative. The hilarious Blake Edwards motion picture is good rollicking fun, an 'Oldtimer Epic' for the whole family. 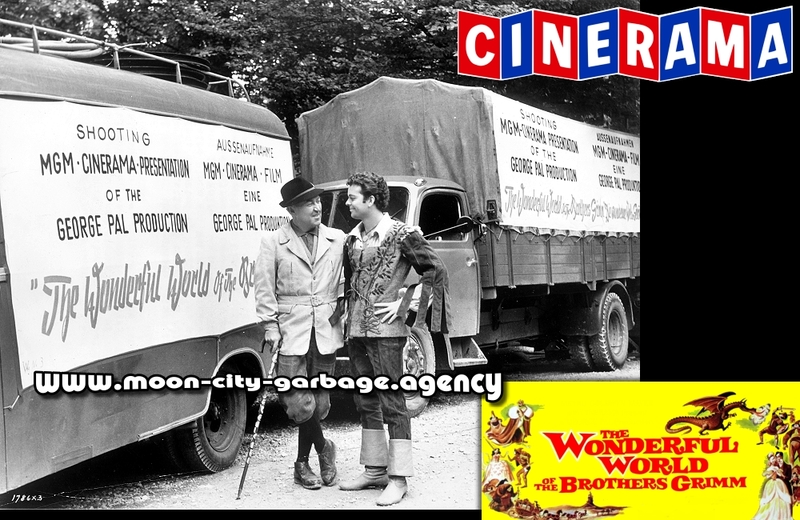 A great circus with slapstick elements! You will find several 'Great Race' stories hidden somewhere in the shallows of my poisonous blog. Here is one about the Cars in 'The Great Race': The muscle car of Professor Fate! And one on the mechanical effects work: Garage King Danny Lee! Director Blake Edwards, best known for 'The Pink Panther' series, rehearsing a scene for 'The Great Race'. He is sitting next to the Micro Giraffe boom wearing a white T-Shirt. Straight after this epic adventure he shot a neat War movie comedy, 'What Did You Do in the War, Daddy?'. I enjoyed these kind of family epics with Oldtimer cars much more than 'racetrack-flicks' like 'Grand Prix' or 'Le Mans'. The Oldtimers are so much cooler ...and smarter! 'Those Daring Young Men in Their Jaunty Jalopies'. In Europe better known as 'Monte Carlo or Bust!'. After the great success of 'Those Magnificent Men in Their Flying Machines' he tries the same formula on the road. Which surely wasn't a bad idea! 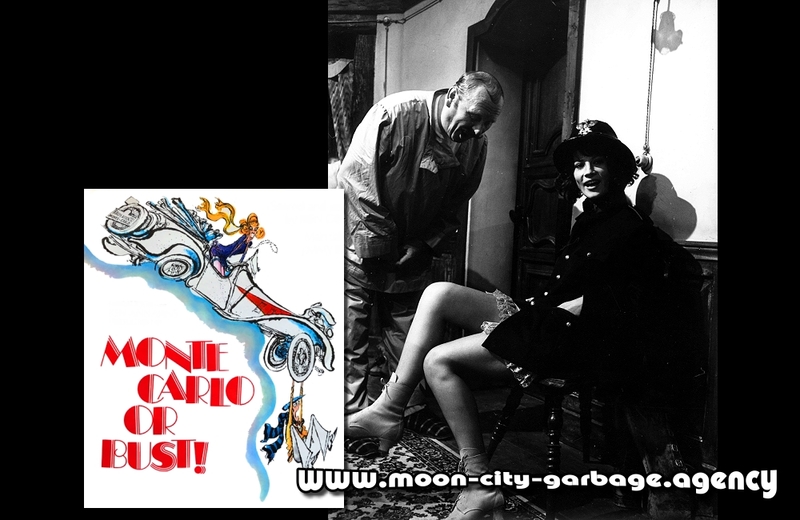 Funny gags, a great cast and a smashing Ron Goodwin score - 'Monte Carlo or Bust!' is a Winner ...with a flat tire! Never a problem, the groovy clown limps to the finish! Hooray! as they made excessive use of blown-up photo backings and other tricks. Some good-looking outdoor shootings could actually have been created in the studio. The whole production is not the brightest candle, but I receive some very good vibrations. 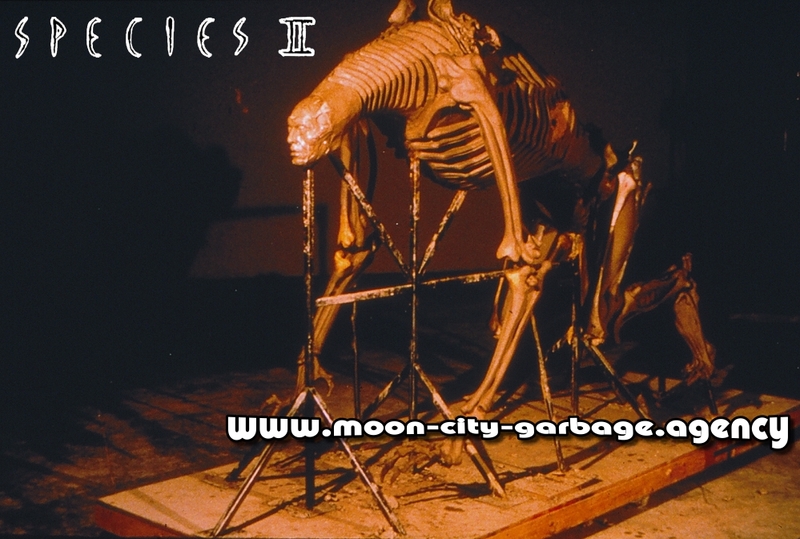 Definitely a movie for my little moon-city-garbage theatre. Got some nice hardly known photos of the show. Gert Fröbe looks for birthmarks on the thighs of Nicoletta Machiavelli. Behind-the-Scenes of 'Monte Carlo or Bust!'. Between two takes on a studio Set of 'Monte Carlo or Bust!'. The light-hearted epic of Ken Annakin is available on blu-ray. A fast and crazy stage show from the Golden Age of Epic movies! 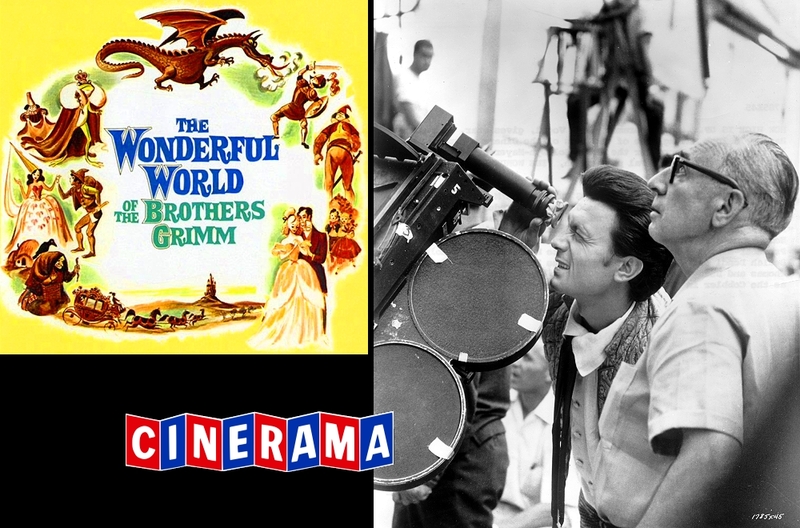 MGM-Cinerama presentation of Pal's production, 'The Wonderful World of the Brothers Grimm'. Tamblyn co-stars with Yvette Mimieux in the delightful 'The Dancing Princess' fairy tale from the film. The labeling of the location trucks is bilingual, English-German, since the film was shot on location in Germany. with Barbara Eden, Oscar Homolka and Ian Wolfe co-starred. 'The Cobbler and the Elves'. The extremely charming epic was filmed in the elaborate 3-strip Cinerama (2.59:1). Three specially captured 35mm images projected side-by-side into one composite widescreen image. project the three images (A-B-C) simultaneously, producing an ultra-wide picture on a 146° curved screen. The English DVD that I have clearly shows the difficulties of the 3-strip Cinerama. at the joints between the 3 pictures two vertical stripes became visible (A-B, B-C). But even the poor DVD (many distortions) has this 3-strip Cinerama WOW effect! Every small room looks gigantic, every view in a little street looks colossal. The well-chosen camera positions reinforce that enormously. Have never seen a full height 3-strip Cinerama film, but it surely must be a cool experience. Even better than every standard projection in 70mm. Cinerama camera on location at Rothenburg ob der Tauber (Germany). One of the many outstanding locations of 'The Wonderful World of the Brothers Grimm'. Cinerama equipment, on location at the entrance to the Baroque garden of the Weikersheim Castle. three-axle baroque garden from the early 18th century. In the background you can spot the Orangerie of the famous garden. Comparison photo - The Baroque garden of the Weikersheim Castle. goes on a sightseeing tour in Munich and ends up on a flea market. 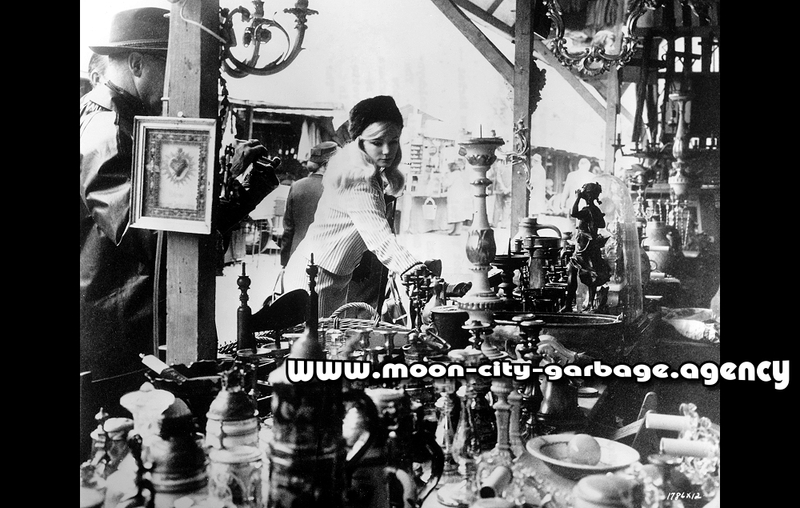 She was thrilled about the variety of strange treasures. The Clay sculpt of the Patrick monster ('the quadruper Alien') prior to final head design, XFX shop. Patrick is infected with Alien DNA which begins to change his body. He is in some kind of telepathic connection with Eve. 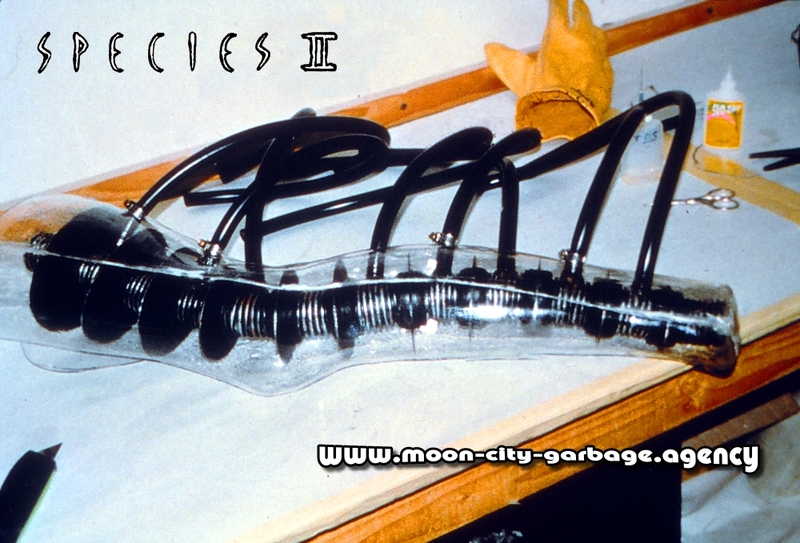 at an early stage, even before H.R.Giger collaborated on the project. 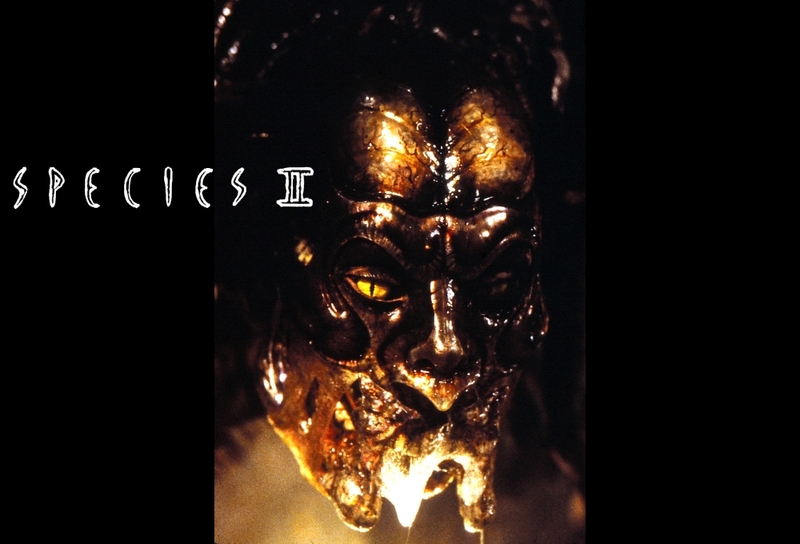 The design of the monster was, at the end, a joint effort between XFX and Giger. 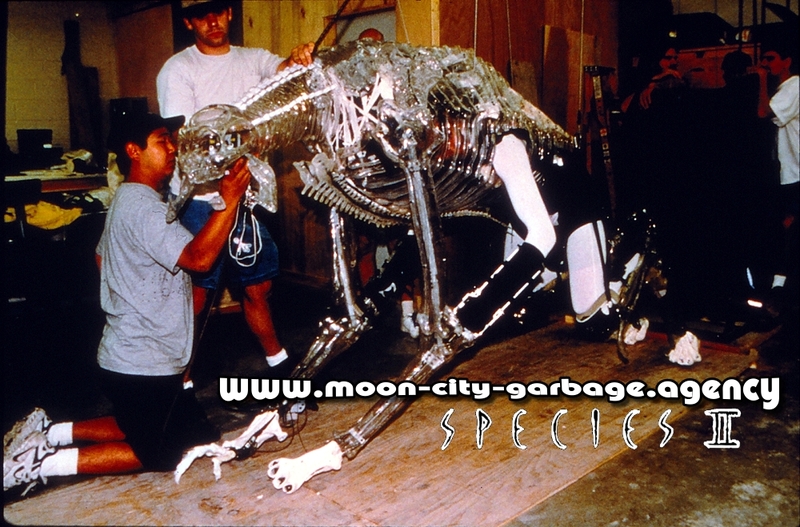 Dan Rebert was the key 'quadruped' designer for the finished final 'show monster'. A pretty big size Alien and not a typical 'man-in-suit' effect. It's hard to see how the whole effectful show of that thing is operated. 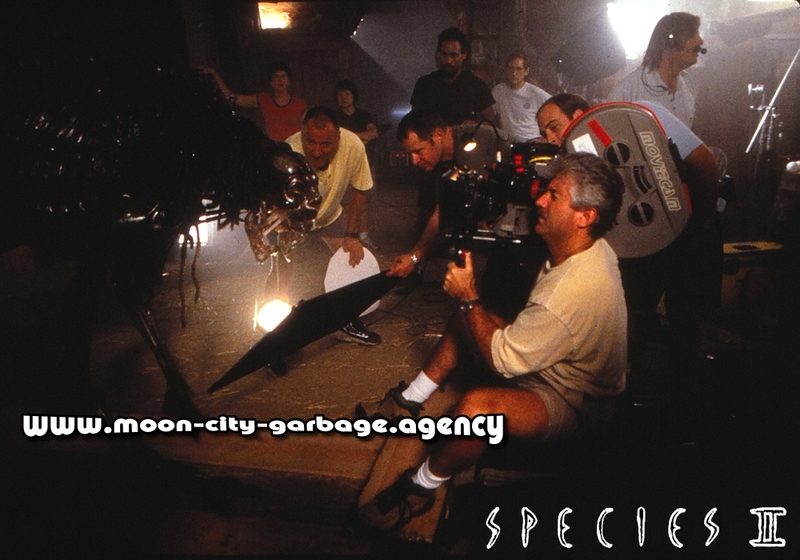 The Animatronic crew of XFX had to come up with something for the agility of the monster. 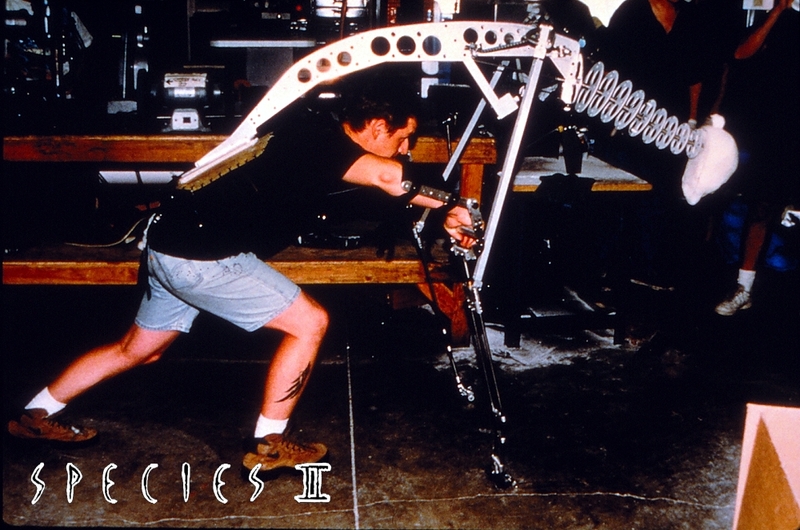 XFX animatronics designer Clint Lynch demonstrates early neck, spine and foreleg assembly. Patrick suit actor Vincent Hammond inside the unpainted 'vacuform shell'. Todd Minobe and Brian Roe of the animatronic crew are rigging the suit up. vacuum-form shells in key areas. The actual 'translucency' trick shot was a quite elaborate work, filmed under water. The XFX crew filmed the transformation of Eve and Patrick without CGI. They tried to avoid CGI whenever possible, and that's the right approach. Through holes in the translucent shell they filled up the body parts with an opaque, flesh colored liquid. begins to crawl and becomes less and less opaque'. Transformation leg with injectors for the flesh colored fluid (reverse filming). On Set - Creature performer Vincent Hammond inside the 'work-in-progress' Patrick Monster suit. when it raises up on hind legs. Operator Vincent Hammond hangs in a special rig. He is fitted with leg extensions and operates the arms like a rod puppet at the creature's elbows. His own arms and the rods you see on the photo (35mm Kodachrome slide) are removed computer graphically. Patrick (Vincent Hammond) ...and cinematographer Matthew F. Leonetti ('Poltergeist') in action! Looking back, certainly not a bad design. Boy, you're drooling like crazy and you've got a nasty bad breath! Michael Madsen and Vince Hammond (Patrick) in conversation. 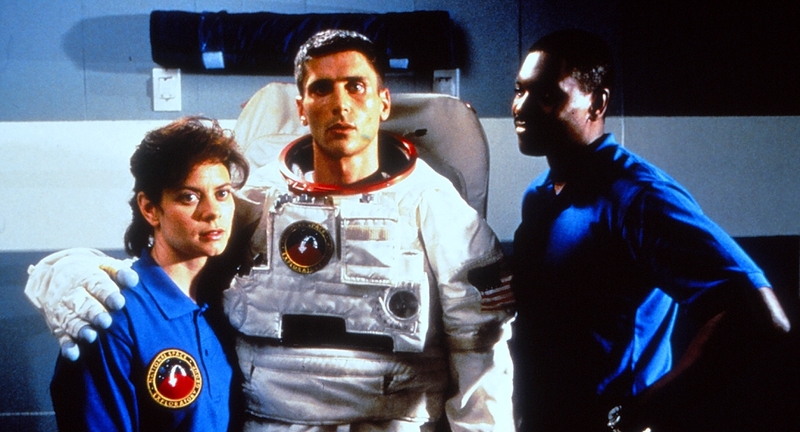 Even Astronauts do not always have it easy, especially when aliens hide in their luggage. Of course you want to know more about that! - Hookers love Aliens ...but not for long! Astronaut Anne Sampas (Myriam Cyr) 'dissecting table puppet'. She gave birth to a snappy tentacle and was not really in the best shape afterwards. - The tentacle of love! I recently watched 'The Statue' for the very first time. Uuuhhhhh, what a painful experience and a waste of precious life time. the great John Cleese and, well, the rest was just tiring. It's no wonder with John, he loves even the cheapest silliness. Lol. And this stuff here is really the cheapist of the cheap crap! It didn't work in the 70s and today, almost 50 years later, ...an educational film about how not to do it. Comedy is not as easy as you might think. 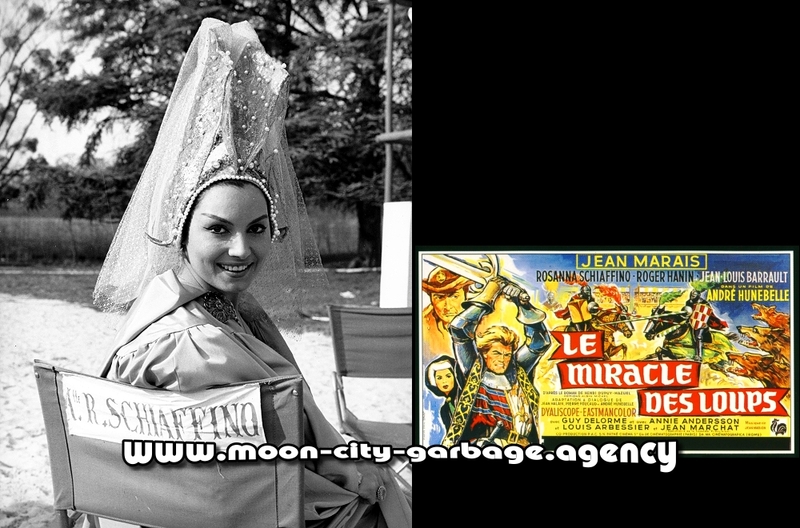 Excellent Players like Virna Lisi, David Niven and Robert Vaughn are completely wasted. The experienced Makers, such as the director Rod Amateau and the cinematographer Piero Portalupi, work without any inspiration. 'The Statue' is unbelievable poor, embarrassing ... shockingly cheap and naive! 'An amusing and sophisticated romp!' said the movie review in 'Variety'. This was certainly written by a guest film critic of the planet of the apes. The best on the DVD is the archive documentary 'Conversations with David Niven'. 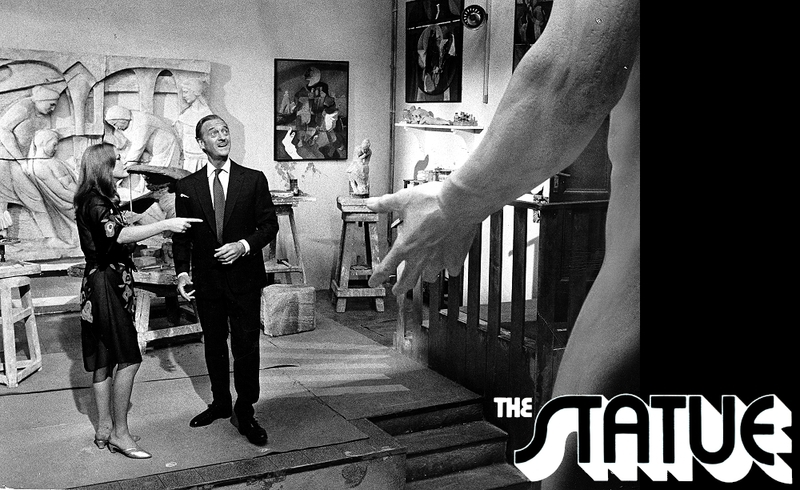 The statue of Alex Bolt (David Niven) in the studio of his wife Rhonda Bolt (Virna Lisi). 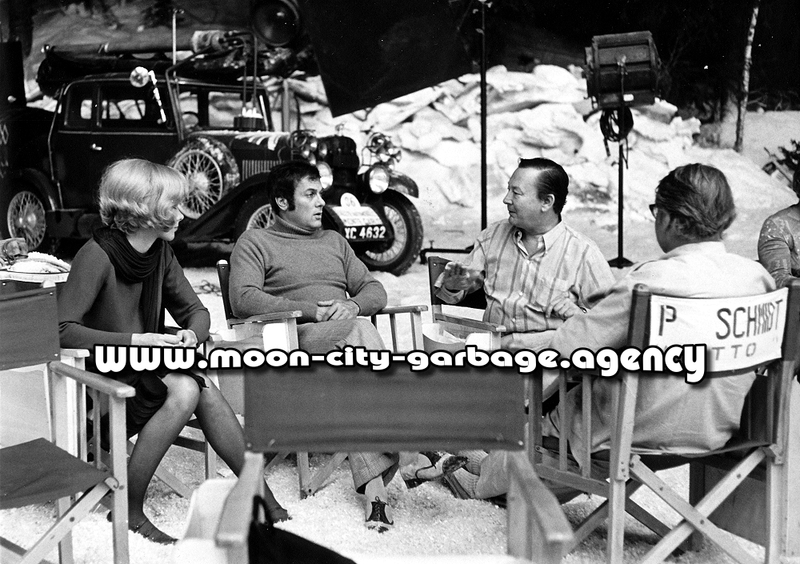 Cinecitta Studio Stage, 1970. The marble like statue is a nice movie prop (Sculptor?) made of polished plaster. The artist probably started with a small clay maquette to show it to the Art Director and Rod Amateau. After their okay he/she 'sculpted' the hollow figure. To use real marble was out of the question. The material is expensive and to make such a big statue would take a great deal of time even for an experienced sculptor. I am a great admirer of elaborate Film and Stage Set Design, a too often underestimated art. 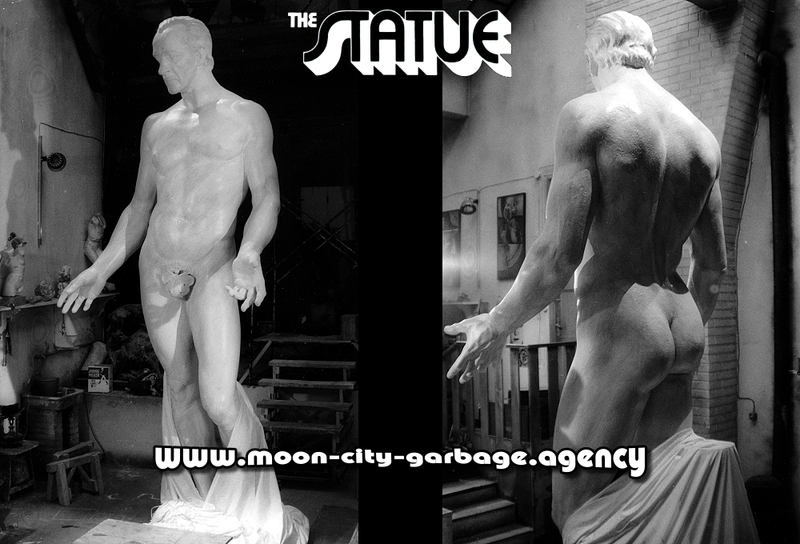 'The Statue' is a good example for a set design ...without design (?). The Studio of Virna Lisi has no resemblance to a studio of a sculptress working with marble. How was she working on the figure? Was she flying around the marble block like Supergirl with a hammer and a chisel in her hand? Thought too short ...and too cheap! Looking for good comedy! 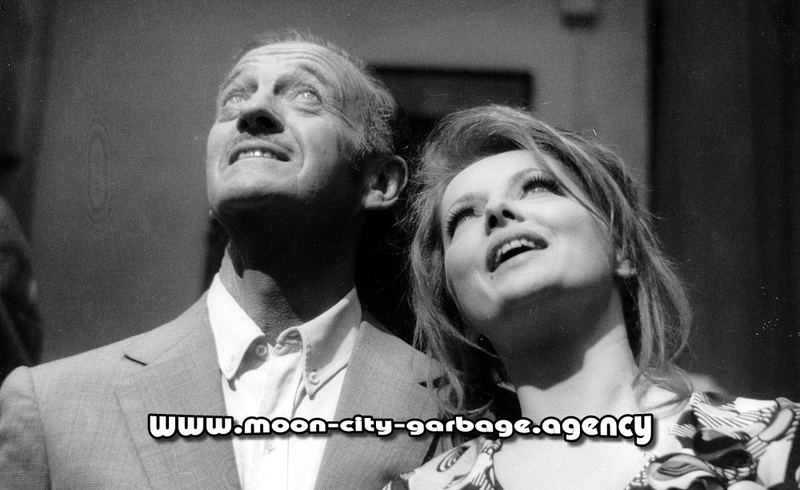 - David Niven and Virna Lisi. Both have made many much better movies than 'The Statue'. David Niven (1910–1983) did for example 'The Guns of Navarone' and 'The Brain'. Virna Lisi (1936–2014) was playing in 'Assault on a Queen' and 'The Secret of Santa Vittoria'. All on this channel! - Forget 'The Statue' and use 'The Brain'! A well-made prop of an unknown artist (?). The head is perfectly sculpted. 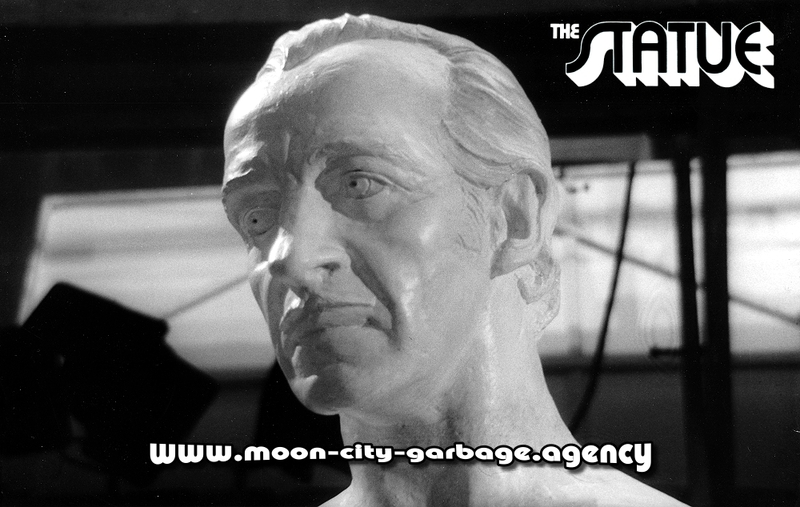 A splendid reproduction of the head of David Niven. The material looks a bit like soapstone on this close-up! I wonder what happend with the statue. Perhaps David Niven got it for his garden to keep out pests or to scare off annoying neighbors. 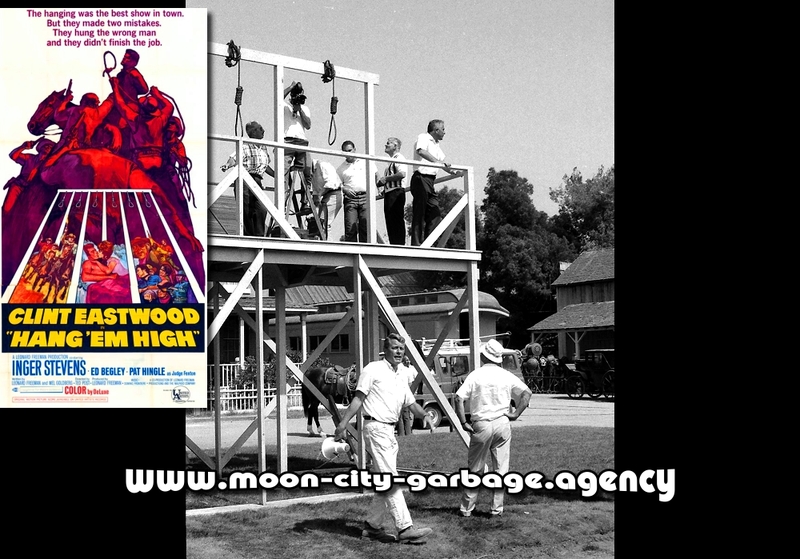 'Hang 'Em High', summer 1967.
but only a few mention Ted 'Rawhide' Post as an important director for Clint's career. the first production of The Malpaso Company, Eastwood's own production company. On his side the Art Director of 'Rawhide', John B. Goodman. often dark and dirty scenery of the European 'Spaghetti Western'. Everything is clean and spruced up here, even the joyfully awaited show in the 'Circus Maximus'. The Event hangings in the middle of the town. 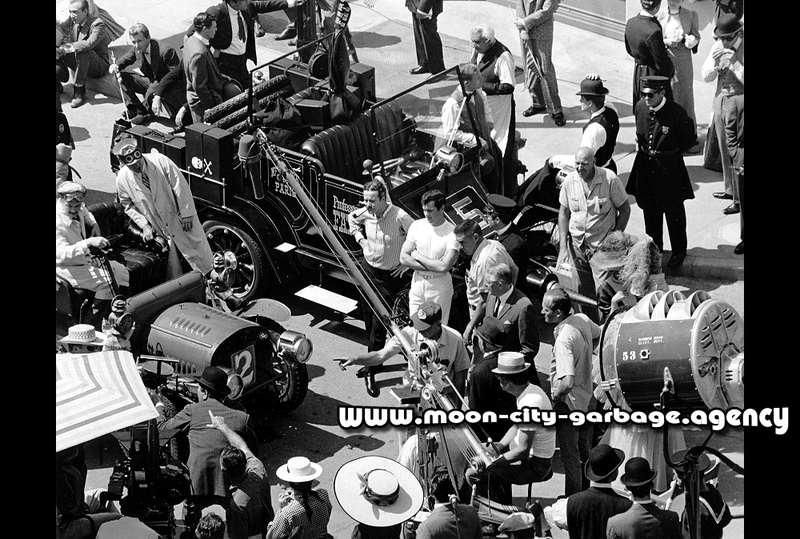 The whole Set Design of the Town, prepared on MGM Studios backlot, seems pedantically clean. It smells like fresh flowers and popcorn. Finely dressed petty bourgeois wait for the dirty event of the day. A surreally brilliant scenic design. The wooden gallows were built up in the middle of the Town ('Arena'), on a fresh green piece of lawn. The bold design style for the event hanging show gives the film a bit of a unique look. 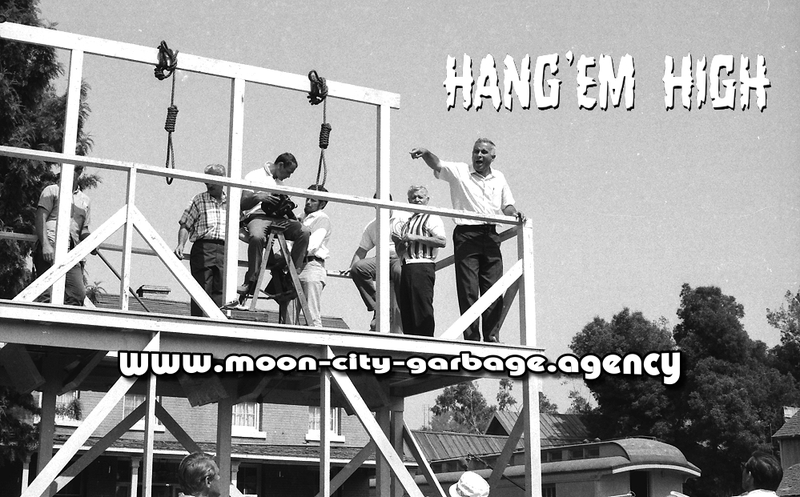 Seat buyers loved the movie, 'Hang 'Em High' was a major success. 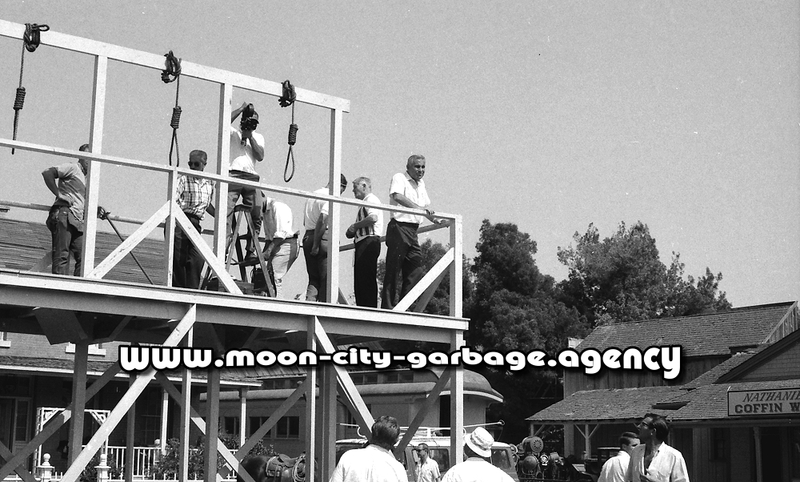 Director Ted Post (1918–2013) enjoys the view from the gallows. nominated for three more, all in the category Best Art Direction. 'Hang 'Em High' was his last feature film. to make this film instead.